- Renew gym membership = done! About halfway through January I started a new gym membership at Pure Gym, Newtownabbey, with Gemma, Laura & David. It's going well so far, 3 times a week, and we've got a nice wee routine going. It definitely helps that there's a few of us going, we motivate each other and make it that little bit more ridiculous & fun than if we were just struggling along by ourselves! Plus, it's only £10.99 a month, winner! - Get rid of all the junk food = kinda done? Okay, so this took a lot longer than expected...there was just so much chocolate! There may or may not still be some sweets/chocolates in my room, but for those I place all of the blame firmly on David. He is forever bringing food to my house, and I have very little will power when it comes to junk food. But on the upside, none of it actually belongs to me, so it still counts...right? - Start a scrapbook = done! I actually started my scrapbook, and I think this is the one thing I'm most proud of doing. Probably because it was very likely that I'd start it, and then never get round to actually looking at it. However, this is not the case! I've been working on it consistently all month, and I'm so happy with how it's looking! I've mentioned before that scrapbooking actually pretty stressful, but I think I've moved passed that now, and I'm just enjoying putting all the photos together. I love looking back through it already and it's nowhere near done, so that must be a good sign! - Clear out of wardrobe/room = not done. Yeah, this didn't really happen. Like, at all. Not even a little bit. I've tidied my room, it got messy, I've tidied it again, it got messy again, but as for any major clear out of clothes/junk/stuff, it just never happened. Maybe this month. I love reading. I could easily spend all day reading, and not want to stop. In January though, I only read 2 books, The Miniaturist by Jessie Burton & The Help by Kathryn Stockett. Both really good books, I thoroughly enjoyed them both. I might do some reviews at some stage. I also feel like I did alot better with only reading 1 book at a time, although this may be why I only got through 2 books...hmm. This is not going so well. Saving is not a strong point in my life, apparently even when I have something exciting to save for it still just doesn't work. David's doing alot better at it than I am, but I just get sucked into sales, & books, & make up, & so many other things. It's definitely something that I need to work on! Start as we mean to go on, right? Seriously, though this is a major area of my life that I need to improve on. I need to stop buying things and being so silly with my money! 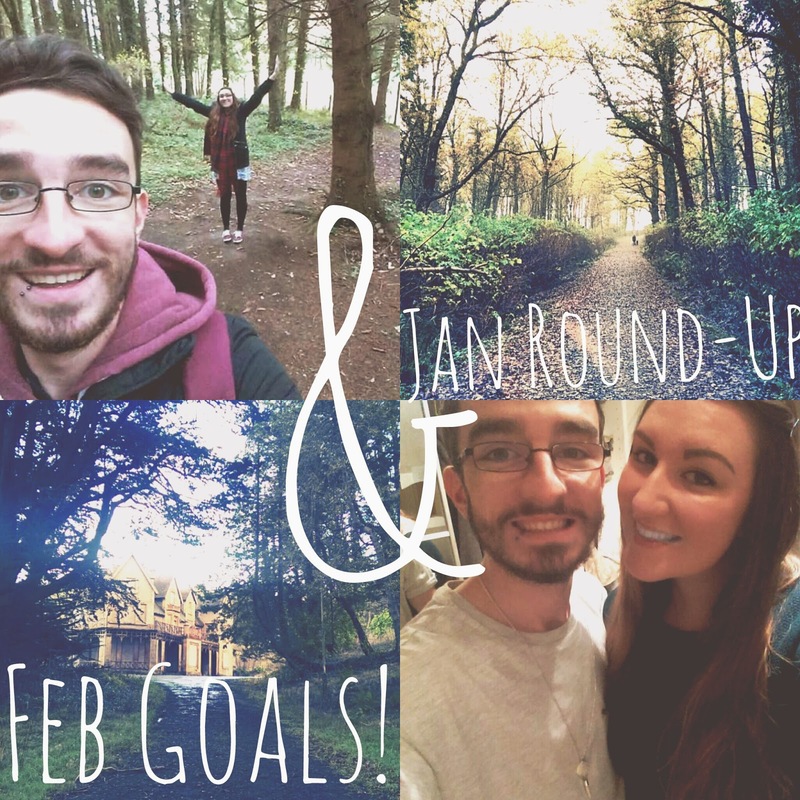 Last month saw a new printer, a new gym membership, cinema trips, date nights, roadtrips etc etc. Rome is in a solid 25 days, and unless I start saving some cash it'll be a very interesting trip indeed. I used to write in my prayer journal all of the time. I carried it everywhere with me, and if I had a spare moment or 10, I always had something to write. And I miss it. It's such a great way to get your prayers down & keep track of people/things that you're praying for. As someone who still finds it a bit difficult to pray out loud, I am far more comfortable writing my prayers down, and a prayer journal is the perfect outlet for prayers, questions, devotions, random thoughts...I haven't been doing it as much recently, but this month I'm going to try and get back into it, & start praying intentionally & with focus again! I love planning out what we're going to do/where we're going to go when I'm away on trips, so I need to have a wee look for some travel guides & work out a daily plan for our time in Rome. I've had a bit of a look on Pinterest and found some wonderful tips, but I'm excited to actually sit down and come up with a plan! - Book an eye test! I've had glasses for a while now, and I've been wearing them pretty much all of the time for about 2 years (I think, maybe? Who knows! ), but I'm 90% sure that they aren't the right prescription for me anymore. I've been putting an eye test off because of goal no. 1, but the glasses I have currently are my only pair, and they also happen to be slightly, well, broken. So, I need a new prescription & new glasses so that these ones don't happen to break while I'm in a foreign country! As fun as I'm sure that would be...Thanks, but no thanks!